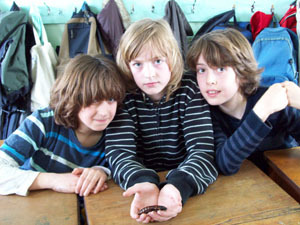 The show is an exciting introduction to the world of invertebrates. With the help of his collection of giant creepy crawlies Pete leads the children on a fascinating journey into a world where hairy legs are used to "see" with, leaves turn out to be animals, scorpions use scissors and crickets have a very unsavoury way of defending themselves! The children's (and adults'!) comfort during the shows is of great importance. No animal is taken closer to a child than they are comfortable with. Spiders, and any other animal that can sting or bite are kept in sealed containers during the sessions.